1) It is God who calls men to positions of authority. 2) This call will come by way of prophecy to someone in authority. 3) This call will be carried out by the laying on of hands by someone in authority. This tells us that man cannot take unto himself the authority to teach and administer in the name of God, but rather that God will call whom He chooses to administer in His name. 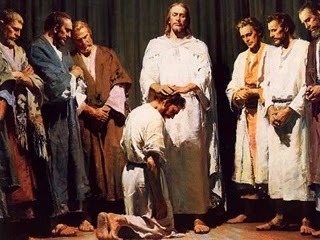 He will reveal such call to one who is known to have authority, after which, said calling will be conferred to the recipient by the laying on of hands. This follows the pattern which Jesus set in His calling of the twelve apostles and is in accordance with the order by which God operates. Next Week: Article of Faith #6–Mormon beliefs regarding the organization of Jesus Christ’s church. This entry was posted in God, Mormons, Religion and tagged Jesus Christ, Mormons, Prophecy, Religion, Revealation, The Articles of Faith, The Church of Jesus Christ of Latter-Day Saints. Bookmark the permalink.